Soon after Lincoln's inauguration, the Civil War began, dividing the country between the North and the South. Initially, the SOuth won several major battles. The North then turned the tide of the war with victories in both the West and the East. In April, 1865 the Confederates surrendered, and the North won the war. The war resulted in terrible death and destruction but also led to the long-sought freedom of enslaved Africans. When compromise after compromise failed, the US was divided by war. The American Civil War tested the strength of the bond between the states. 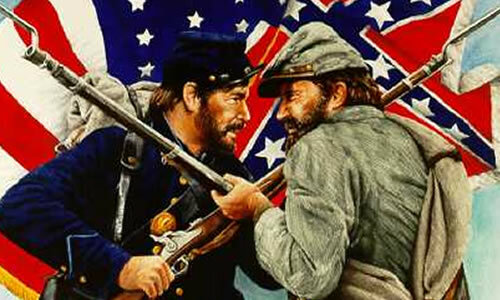 During the Civil War, Americans fought each other on battlefields and in government. Ideas about slavery and sovereignty led many soldiers to fight. Eventually the nation was reunited, but deep scars remained. In the next two chapters, you will learn about the war and the period after when rebuilding the South became a priority. This painting is titled Fight for the Colors. It shows Union and Confederate troops at the Battle of Gettysburg, which began in Pennsylvania on July 1, 1863. 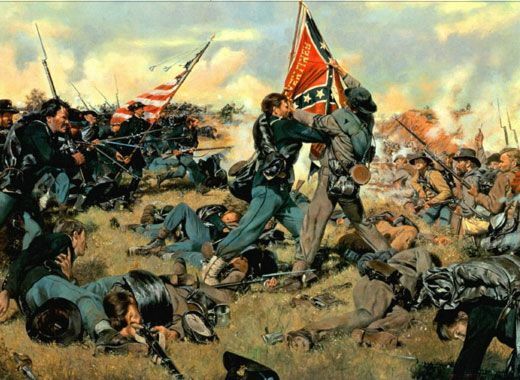 This 3-day battle was the largest and bloodiest in the Civil War.